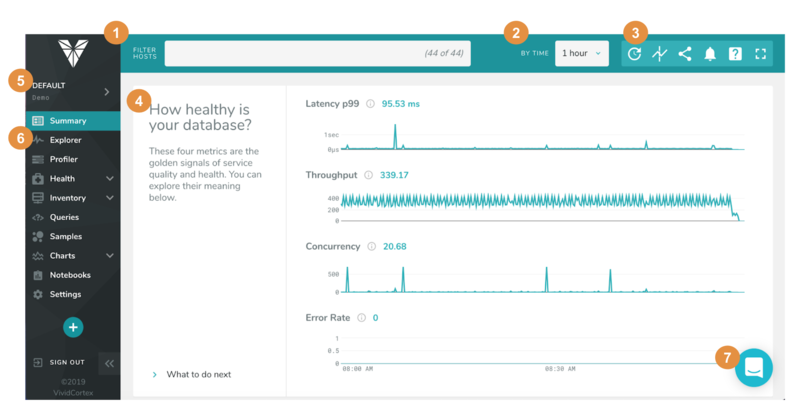 VividCortex makes best-in-class database performance monitoring easy. To get you off to a fast start using some of the system’s key capabilities, we created this guide. It offers step-by-step instructions on how you can find answers to a few questions that database administrators, developers and managers face on a regular basis. What queries are using the most system resources? How can I find new queries? How can I measure the impact of a code deployment? Identifying poorly performing queries gives you clear and unambiguous direction for how you can improve query performance and, ultimately, application performance overall. 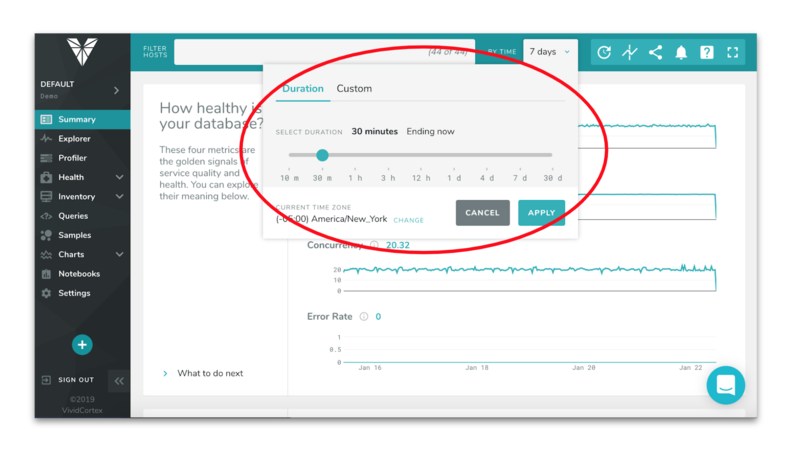 Set the Time Picker to the period you want to view and analyze. All data you view in the VividCortex app will be contained to your specified period. 1 Hour, 1 Day, or 7 Days are good default time periods. Select the Profiler on the Navigation Bar on the left side of the screen. Metric by which the items will be ranked. Text-based filters, depending on the item type selected. In this case, select Queries, ranked by Total Time. The default number of items the Profiler ranks is 20. 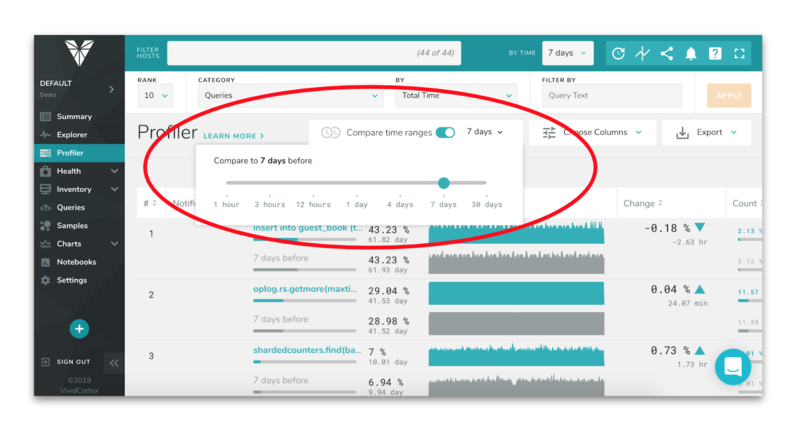 The Profiler will display the queries that consumed the most total time to execute, during the time period selected. You can click the Choose Columns button to customize what information displays. Optimizing the most time consuming queries can improve system and application performance. 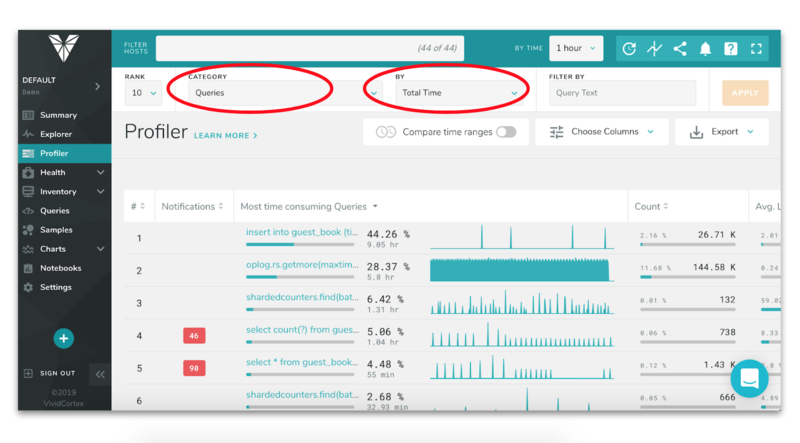 By locating all new queries, you can learn what new workload has recently impacted the system and when it was first introduced. Set the Time Picker to reflect the amount of time that has passed since the new code was deployed. If you are not sure when new code was deployed, 1 Day or 7 Days are good default time periods. Select Queries on the Navigation Bar on the left side of the screen. Click “New Queries Only,” then click apply. VividCortex will now display only the queries that appeared for the first time during the selected period, and when the query was first seen. By comparing the difference in system performance before and after a code deployment, developers can understand exactly how their code changes have affected the database. These insights enable developers to see measurable results of their actions, both improvements and potential issues alike. Set the Time Picker to “Past 7 Days” and “Ending Now.” This will show you all results collected by VividCortex over the past week. 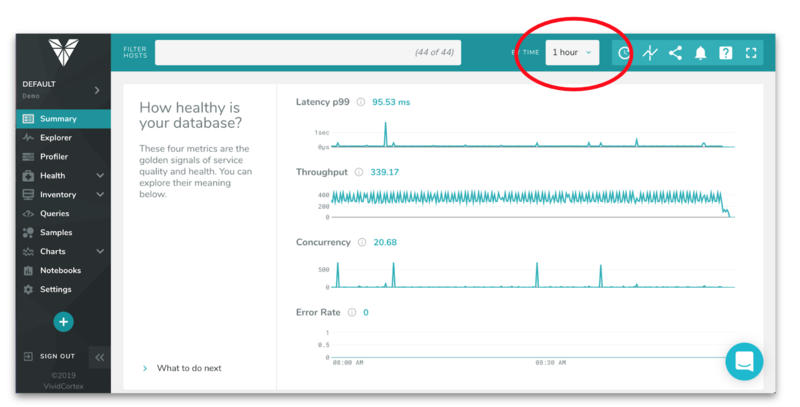 Toggle on the “Compare Time Ranges”. The default comparison window is 1 Hour. Click the drop down to select a new time frame of 7 Days. This will now display the last 7 days of metrics, compared to the prior 7 days. In Rank Settings menu, select Query Verbs, ranked by Total Time. The activity displayed shows a comparison between the past week compared to the week before. Selecting Query Verbs, shows how many read and write actions have occurred in the database, such as “Insert,” “Replace, “Select,” “Get,” etc. A good default is to look at one hour before and after code release, as well as one hour in the same time range, week prior to code release. There are two ways to find answers to questions about VividCortex from within the application. You can get information about the product, how to perform specific tasks, and search Frequently Asked Questions. Or, for hands-on support, you can utilize the in-app chat option. 1. Documentation Within any page you can access Documentation by selecting the Question Mark at the top right within the header menu. 2. Chat support You can reach our support team from any page within the application, through the chat icon at the bottom right.